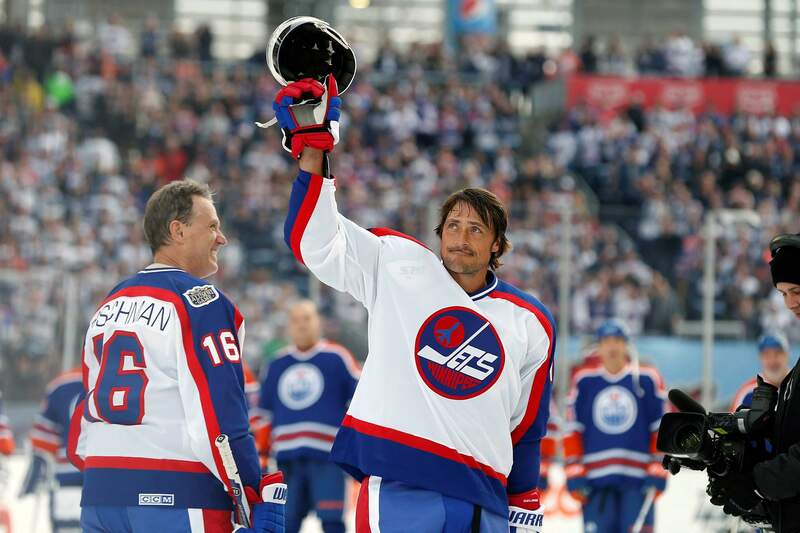 Former Winnipeg Jets player Teemu Selanne (13) waves to the crowd at Investors Group Field prior to the NHL Heritage Classic Alumni hockey game in Winnipeg, Manitoba. Selanne is expected to headline the Hockey Hall of Fame’s induction class of 2017, when it is announced Monday, June 26, 2017. Anaheim Ducks right wing Teemu Selanne, of Finland, raises the Stanley Cup after winning Game 5 of the NHL Stanley Cup final hockey game over the Ottawa Senators, in Anaheim, Calif. Selanne is expected to headline the Hockey Hall of Fame’s induction class of 2017, when it is announced Monday, June 26, 2017. Teemu Selanne and Paul Kariya were a dynamic duo in Anaheim for several years, and now they are going into the Hockey Hall of Fame together. The longtime Ducks teammates are the headliners for the Hall of Fame’s class of 2017, which includes the long-overdue additions of Mark Recchi, Dave Andreychuk and longtime Canadian university coach Clare Drake. Canadian star Danielle Goyette became the fifth women’s player elected, and Boston Bruins owner Jeremy Jacobs got in as part of the builder category. Selanne was elected in his first year of eligibility after putting up 1,457 points in 1,451 games over 21 NHL seasons. The “Finnish Flash” was a 10-time All-Star, had 76 goals as a rookie with Winnipeg in 1992-93 and won the Stanley Cup with Anaheim in 2007. One of those was Kariya, who played alongside Selanne for parts of six seasons with the Ducks, helping hockey grow in Southern California in the 1990s, and then another with Colorado. Kariya had his career cut short by concussion problems, finishing with 989 points in as many games. Recchi’s election ended a curious omission for a player who won the Cup three times — once each with Pittsburgh, Carolina and Boston — and is 12th in NHL scoring with 1,533 points. Every other retired player from 1-28 was already in the Hall of Fame. “It’s an incredible feeling and the icing on the cake after 22 years of playing the game,” Recchi said. Andreychuk, who’s 29th in scoring with 1,338 points in 23 seasons, was captain of the Tampa Bay Lightning’s 2004 Cup team. Goyette won two Olympic gold medals and one silver medal for Canada and had 113 goals and 105 assists in 171 international games. Drake has the most victories of any Canadian college coach and has influenced the likes of Mike Babcock, Ken Hitchcock and Barry Trotz. Jacobs has owned the Bruins since 1975 and served as chairman of the NHL Board of Governors since 2007. This story has been corrected to delete reference to Kariya winning Cup in 2007.